This dis-ease can manifest itself as a pain or a growth or as an injury. It can be on different levels of the mind, or body, and if not brought to ones attention can develop into a life-threatening condition. What people need in this busy world is some stability. By having the knowledge that the "I", the person within the body, is never-changing and lives on till eternity. If we bring more of this non-changing state of awareness into the busy life that we lead, it brings us comfort and security, stability in the face of major changes in our life. From this infinite, stable state of self-awareness we can take the conscious mind to look at all the organs of the body. In this quiet state we can feel any un-ease or slight sensation of pain. This discomfort may have been caused by stress or a negative emotion and these feelings of discomfort can turn into the seeds of disease. If we have a disease or problem area in our body, in this state of quiet meditation, we can take the conscious mind to that area, investigate the problem and decide the best course of action to correct this imbalance or physical damage. A good way to look at the body is a bit like looking at the country. Just as the country is made up of lots of individual people, all pulling together to benefit the whole country, we can look at the body as being made up of lots of individual cells. Just imagine yourself in an aeroplane at night looking down at a large town. We see all the car lights driving down the road. This reminds me so much of the blood of the country flowing around the country, carrying all the knowledge and materials needed to maintain the country in good health. In the same way, as we meditate we take the conscious mind to finer and finer levels of the thought process. This feeling of expansion also has a physical side; we see finer and finer levels of the physical body. For example, we are deep in meditation and we feel a slight pain in the heart. Our attention is naturally drawn to that area of pain. In our awareness we get a vision of our heart. At first this is a general outline and we notice it pulsating as it performs its natural function. As we carry on meditating and go a little deeper into that quiet state of meditation, we notice the heart is coming closer and getting bigger. We find that we can go inside the heart and check out all the arteries. As we go even deeper, we start to see all the cells that make up the heart and, if we want, we can talk to these cells and ask if they have any problems. 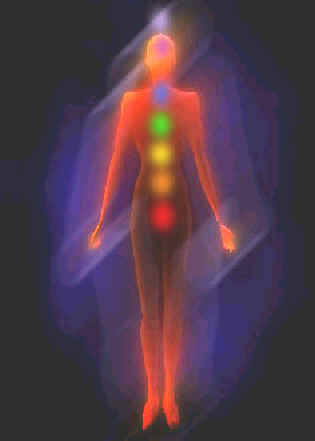 In this way we can see and find out what imbalances exist and what is causing the problem. Another example may be that we live in a town where the Queen is coming to visit and the whole town gets excited. The Queen arrives and her kind words uplift all the people and for weeks and months afterwards there is a feeling of warmth and love in the town. In the same way we can take our conscious mind, like the Queens visit, to an organ like the heart, and in that quiet state of meditation visit that organ, and thank all the cells for their untiring work in keeping the body in perfect health. We can praise them and appreciate their work. We can listen to their concerns and suggest remedies. One concern they may have is that there is a deposit building up on the inside of the arteries. This may be caused by too high a level of blood cholesterol. In this quiet state of meditation were the mind is expanded and you feel at one with yourself and the universe, you could introduce a small impulse of thought or a very fine feeling that says: I want to be more aware of what I eat, or I want my digestive system to stop absorbing cholesterol; or you could ask the cells who are responsible for cleaning the arteries to recruit more cells and design a more efficient cleaning method. The possibilities are limited only by our knowledge and perception. Just as in the physical world in which we live technology is forever advancing, new materials are being designed, better designs and layouts of roads, buildings etc. ; in the same way, in this quiet state of meditation, we can suggest to our cells DNA that we want the body to work in a more efficient way. You could suggest that you want some cells to look at what is happening in other parts of the body. Is there a material in another part of the body, which could be utilised to solve a problem here? If so we can increase the knowledge of the cells to use this new design and bring about an improvement. This has been going on for aeons in the subconscious of man and forms the basis of human evolution. But with modern techniques of meditation it is now possible to speed up this process just by becoming aware of it. Remember what happened when you were conceived, you started off as a single cell which was fertilised. The whole of your being was there, in seed form, the physical, the mental and spirit. During fertilisation the egg took on the spirit from the two parts; female egg and the male sperm. So even at this early stage of development we have all the levels of the mind present. All we gain as we grow is intelligence as more cells are added and knowledge and experience which we gain from the environment that we interact with. The spirit grows ahead of the body in the form of an aura of pure energy and becomes the blue print that tells every cell what to specialise in to fully develop that, which you really are, pure spirit. As you grow so does your consciousness. Consciousness is an electro magnetic field, which is generated by all the atoms, and molecules that go to make up each cell. A good way to think of this is that the particles make up our bodies and the wave function of the atoms make up our consciousness and join us to our environment, we are joined to the environment through the interaction of atoms that produce light waves and sound waves, and through the other three senses of touch, taste and smell. Therefore the wave function of matter is an extension of our individual consciousness. The spirit is pure energy, which does not take the form of atoms, but is more subtle; the Quantum Vacuum State in physics describes a field of pure energy which is pure potential, full of energy in motion, but not yet manifest into discrete particles or waves. It stretches out to infinity and is timeless in its non-changing state of pure potential energy. So you may ask, how does this field of pure energy take up and become an individual soul? Just think of it as walking through the countryside and using the sense of smell. One minute you are walking past some honeysuckle, the next, you are going through the farmyard, and the next, you may be passing a field of lavender. The point is: the air is all around you, but it takes on the local qualities and becomes individual. The same with the spirit and the soul, it is all part of the sea of pure energy of the Vacuum State, but it has taken on an individual quality. That which you can identify as yourself, that which does not change as your body changes, as you grow old, that which lives on when you die, because it never came out of the underlying field of pure energy. All matter is supported by this vacuum state; therefore as we are made of matter we are supported by spirit in the same way. How does one's consciousness change as we evolve and become more spiritual? The main change we notice is from being caught up in an individual thought, and having it take over our entire mind, to having a more expanded view on life. When we get a very strong thought especially a negative one it can sweep us along and we can find that we have done things that we really did not want to do. To avoid this happening it is possible to experience thoughts on different levels. I.e. if a strong unpleasant thought comes into the mind, take the mind to the physical body and you may experience a twitching or sensation in one or more parts of the body. Just let the mind experience that sensation for a little while. Think of that area of the body regaining in balance and harmony. When the sensation eases take the mind back to the thinking process and you will find that those strong emotions have passed. Through this process you have managed to break the cycle of action and reaction that continues to cause these tensions to build up in our bodies. It is also noticeable that as the mind expands, this is when, the consciousness starts to experience more at the same time. Therefore each individual thought occupies a much smaller part of our consciousness. If you can imagine the mind like the ocean and our consciousness and thoughts like the waves of the ocean, then as our mind becomes conscious of the more subtle layers, we get more depth to it. We start to take in more of the silent layers of the ocean so that you have the waves and you have the still water under the waves at the same time. Another way of looking at this is like watching a film at the cinema; you have been so caught up in the movie you have lost sight of the white screen on which the movie is showing.